Click here to go back to Chapter 8. The chapter starts with your character having a dream/vision of the Eternal Throne in flames and surrounded by the corpses of both friends and enemies. Valkorion tells you that you are ready, but just as you want to sit down and claim the throne, Vaylin appears behind you and stabs you. You wake with a start aboard the Gravestone (strange time for a nap, considering, but I guess you must have been really tired after everything that's been going on). Lana tells you that she's been studying the holocron you brought with you from Nathema but still doesn't know what it really does. An annoyed Valkorion chimes in to mock the idea that this "dusty trinket" could harm him. The Emperor doth protest too much, methinks! Soon it's time for the Gravestone to punch a hole through the ranks of the Eternal Fleet ships surrounding Zakuul, while you launch yourself into the general direction of the Spire inside a boarding pod. Depending on your previous choices, you'll either be accompanied by Senya and Arcann or by Theron and Lana. Your aim is passable and you land near the mid-level entrance to the structure. At the door you get accosted by several Knights of Zakuul backed up by a couple of walkers. Fortunately Indo Zal and his rebel friends are at hand to help you take them down. I always feel like there should have been an option to reason with the Knights here. "You are not mindless robots, why are you defending an empty building while the fleet is out of control and raining death upon your people?!" You fight your way past some more Knights and skytroopers inside, and take the lift up to the top. Valkorion uses this as an opportunity to try to convince you that your closest companions are actually dangerous and need to be disposed of. Have you lost all sense of subtlety, old man? 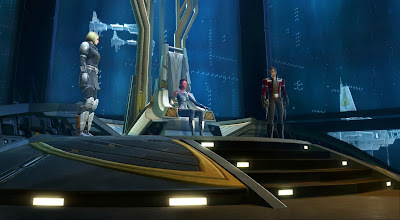 In the throne room, if you have a redeemed Arcann with you, there is a touching scene where he recalls his previous life but consciously turns his back on it. You can even offer him the throne and he will reject it. When you sit down on the throne, a strange power crackles through it and the Eternal Fleet stops attacking, but suddenly Valkorion appears and declares that it's time for him to take over your body to resume ruling the Eternal Empire. You can try to defy him, but it's futile; he forces you to bow to him and then knocks you out. 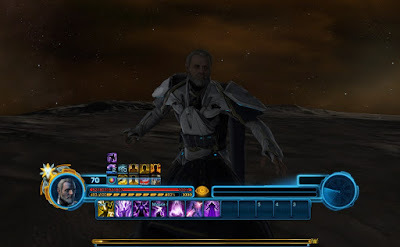 You awake in a dreamscape similar to the one you traversed in KotFE chapter 2, but... in Valkorion's body? You express confusion in his voice, while your own voice calls to you from far away, telling you that Valkorion tried to kill you and that you need to save yourself by finding the holocron. What follows is a hilariously surreal section in which you run around what's supposed to be your own shattered mind, while in Valkorion's body and using his Force abilities against hostile "echoes of memory". Eventually your own voice instructs you to cleanse your corrupted memories or you will be trapped inside your own mind forever. This involves visiting tableaux of a couple of key scenes from the story, during which Valkorion monologues about how everything was part of his plan. He reveals that he was trapped inside your mind the entire time, with his departure in KotFE chapter 12 having been nothing but a ruse, and that he's been toying with you merely to sate his curiosity, until he decided to just hollow out your mind and take over. Eventually you reach a representation of the Eternal Throne, which is located on top of some ancient looking stairs inside your mind. 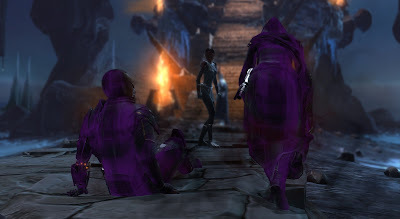 The holocron from Nathema awaits you there and allows you to regain your own body (mentally anyway). In the real world, we can see that you're still passed out and some skytroopers have decided to attack, which your companions are desperately fighting off to protect you. Valkorion appears, amused by your continued resistance. He then raises Vaylin (and Arcann, if you killed him) from the dead, commanding their spirits to fight for him. Meanwhile, if you didn't release Lord Dramath from the holocron in chapter 7, you can call on him here to fight for your side. If Arcann is alive, he uses the holocron to join you in your mind and help you against Valkorion while Senya continues to defend your body. Dramath (if he was present) self-destructs at the end of the fight and attempts to take Valkorion with him, but only pierces his armour. After defeating Vaylin's (and possibly Arcann's) spirit, you manage to turn them to your side and you attack Valkorion together. You seem to be doing well, when suddenly he pushes you all away and destroys the holocron. 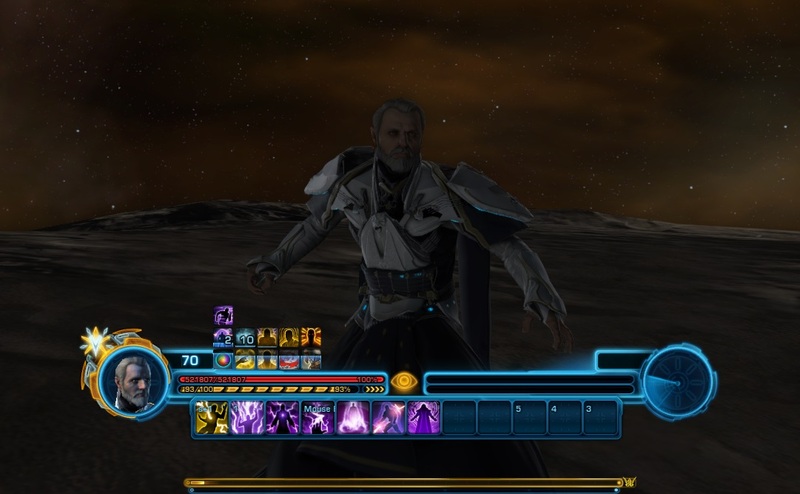 However, you push back, and when you utter the words "Kneel before the dragon of Zakuul" that conditioned Vaylin to be unable to attack, he is suddenly powerless. You have reclaimed your mind and the imagined environment follows your own rules again. Senya appears too (if she's alive, she has joined Arcann's meditation after successfully fighting off the skytroopers; if she's dead, presumably her spirit was inside you somehow, just like Vaylin's) and also strikes Valkorion. He denounces his entire family as "motes of filth" and you strike him down one last time. Finally you awake in the real world as well, to claim the throne properly this time. You can either declare yourself a peacekeeper, intent on making sure the fleet is used to rebuild, or announce yourself as the new Empress. Either way, your Alliance is on top of the world. The chapter ends with Lana and Theron talking outside the base on Odessen, where there's clearly been a celebration going on. Lana reveals that she's already worried again because she can sense "dark forces amassing" against the Alliance. Theron reassures her that you'll overcome whatever the galaxy decides to throw at you, but either way, that's a concern for another day. 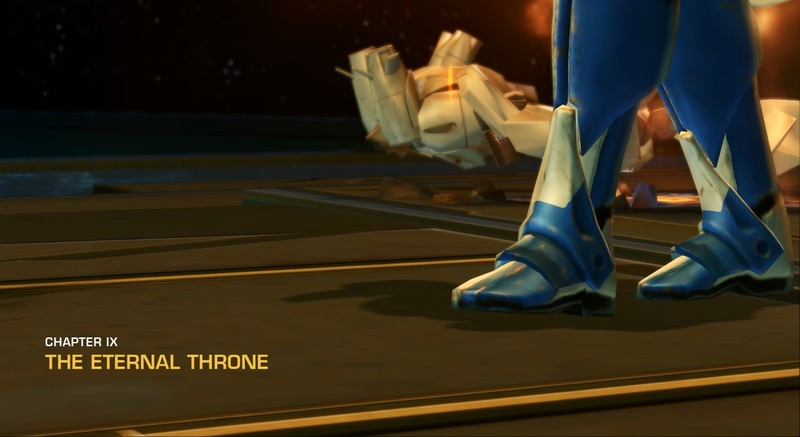 "The Eternal Throne" is a suitably epic conclusion to KotET (and KotFE). Even on my third playthrough there were sections that gave me the chills. It does have some issues, but the good outweighs the bad in my opinion. First off, I absolutely adore the bit where you run around in Valkorion's body inside your mind. 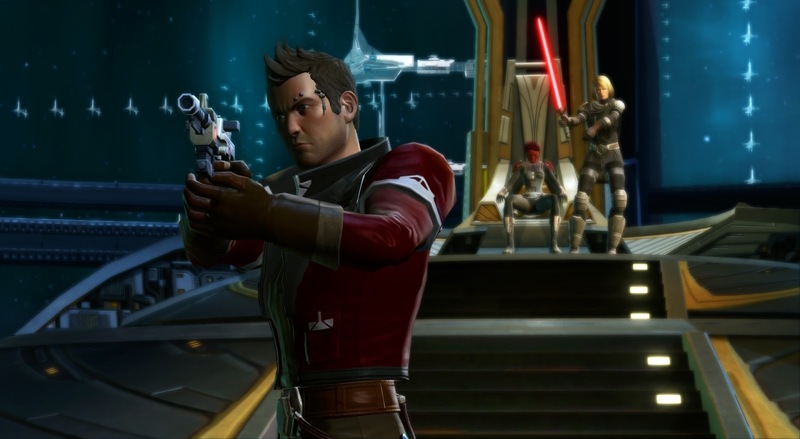 Bioware isn't always very good when it comes to making story and gameplay line up (e.g. important end bosses being pushovers vs. random trash mobs killing you hard), but this is a prime example of how great it can be when they get it right. I mean, on the one hand getting to play as Valkorion is simply hilarious. I think I actually broke out into giggles the first time I got to this part. 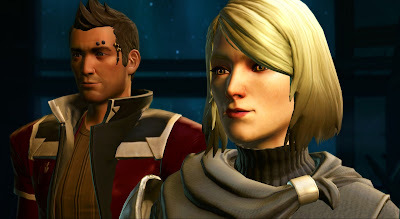 And who else immediately checked whether Valkorion can /dance? (Sadly, he can't.) But on the other hand it's very strange and confusing for the player, and that's exactly how your character is supposed to feel at this point. I also like the multiple ways in which the big showdown is slightly different depending on how you dealt with Valkorion's family in the previous chapters. It's incredibly satisfying to see it all come together. Seeing actual fear in Valkorion's eyes when he's confronted by Dramath. 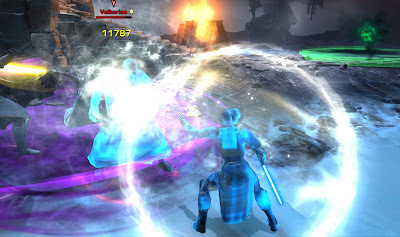 Vaylin getting some revenge even after her death, and the same for Arcann and Senya if you killed them. If they are alive, even better for them. It just feels right. Incidentally, the final fight is also pretty fun from a mechanical point of view, which isn't always true for Bioware's boss fights. What doesn't work so well? Okay, I know that the Force is basically magic and we shouldn't question it too much, but everything that's going on with the holocron in this chapter made my head spin. How can I use its powers to unleash Dramath and weaken Valkorion in my head, while the real thing is lying several feet away from my unconscious body? I know it's a MacGuffin and we're not supposed to question how and why exactly it does the things it does, but come on. 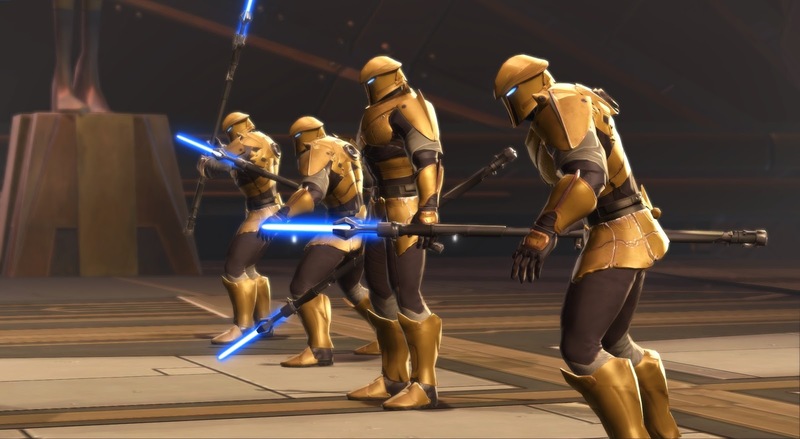 Also, I know I've harped on and on about how certain situations in KotFE and KotET are super awkward for non-Force users, but this chapter is probably the pinnacle of it all. Yes, the commander of Havoc Squad, Cipher Nine etc. are all outstanding individuals, but able to defeat the immortal Sith Emperor in a straight-up contest of wills? The high point of awkwardness for me personally was when using the holocron transformation in the final fight actually caused my trooper to start wielding a lightsaber. Say what now? You could also argue that while the chapter really delivers on an emotional level when you defeat Valkorion (by evoking feelings of vengeance, dispensation of justice etc. depending on your angle), there's also a certain sense of: "That's it?" After all we've been through fighting the Sith Emperor/Valkorion, all it took to take him out was basically someone taking him on at mind-wrestling? Talk about going out with a whimper instead of a bang. It's all dressed up very nicely, with cool cut scenes and dialogue, but the moment you stop to think about it even a little, it's easy to come away feeling disappointed. Some have also criticised the duality of the final choice. Why can you only be a well-meaning steward of the Eternal Fleet or an evil Empress? Where are the options to leave the power to someone else or to be a proper ruler, but benevolent? Well... would I have liked to have these options? Sure. But I'm under the impression that Bioware is going to use our choice here as a springboard for how the rest of the galaxy is going to treat us going forward, and in that case I can see how it would make sense to limit the options a bit. Despite of how it's all framed, this isn't really the end. This is an MMO, remember? Despite all of the chapter's flaws, I came away from it feeling very satisfied. Not every part of the story was wrapped up perfectly, but Valkorion and his family were given a proper send-off that hit all the right buttons for me, and I was left feeling optimistically excited about whatever comes next. Yeah I loved playing all the chapters, I guess the only reason I wasn't having a hard time with non force users in it at all is because in the SW Galaxy everyone has a midichlorian count, some are high like the Jedi, and Sith, and rest are low, but they all are suppose to have a connection to the force. I did enjoy it a lot on my Good guys vs my Baddies, only cause it's a difference of pace. Then after getting Arcann as a Comp, I've opted to do more good, I think it's cool having Mother and Son are permanent Companions. For my liking the story develops to much away from Star Wars. I enjoy to play through the story from KotFE and KotET once, maybe twice, but that's it. The original stories, the war between Republic and Empire, is so much more appealing. Makeb was a nice change to go against the hutts. And SoR...well Revan. Nothing beats Revan. The new chapter-based storyline didn't pick me up in terms of longtime commitment, but i will definitley play what's coming next. "Have you lost all sense of subtlety, old man?" In the TOR era, the Sith Emperor is many things. Subtle, not so much, or at least not for long. To the extent that he appears subtle, it's a factor of the differing timescales he operates on vs mortals. Canonically, he cannot pass up an opportunity to twirl his mustache villainously.